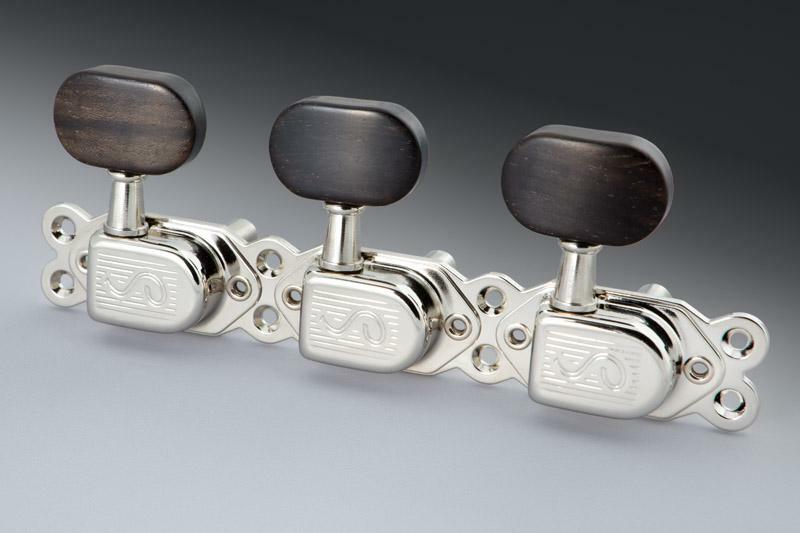 Affordable Selmer style tuners from one of the world's best manufacturers. Nickel Finish. This new line of machine heads, bearing the legendary "S", unifies classic beauty with the quality that is synonymous with Schaller. The "Classic Deluxe" is closely based on the design and dimensions of the Selmer company's machine heads of the 1930s. The top-quality mechanism of the machine head and our ultra-rigorous quality control process combine to make this a truly cutting-edge line. Gear ratio 1:14. Designed using a traditional template, this new line combines classic, elegant aesthetics and luxurious details with innovations that make it sturdy and reliable. The finely-structured buttons, with their timeless oval shape, are made of high-grade polymer material. The baseplate, which is attached to the casing using a special riveting process, has a completely smooth rear surface. In addition to its slim yet robust construction, this means that it can be mounted flush to the headstock without the precious wood being damaged. The low tolerances and high degree of technical precision mean that the mechanical components provide a lifetime of precise action. Whether you choose these machine heads in strips of three or individually, and whether you go for chrome, nickel or gold, the "Classic Deluxe" has the style and class, combined with a perfect mixture of innovation and tradition, to win anyone over. Hand-made button made of high-quality ebony.